EN: Shining Fungus Beetles DE: Kahnkäfer For many years the Scaphidinae were regarded as a separate family, the Scaphididae, but more recent examinations of larval structures, male genitalia, and other characters have determined that the Scaphidinae belong within the Staphylinidae. Scaphidiines do not have the flexible staphylinoid body form, but are box-like and highly convex, with the elytra covering the abdomen. They are seldom observed, but apparently abundant inhabitants of many forest floor ecosystems. 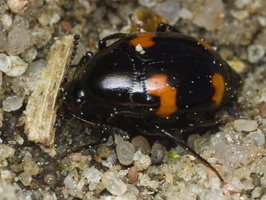 Most species are mycophagous and myxomycophagous feeding in decomposing plant material. Gyvena grybuose, trūnijančioje medienoje.